Click www.drwebman.com/66chevelle to see tons of pics and info. Click www.drwebman.com/64impala to see tons of pics and info. 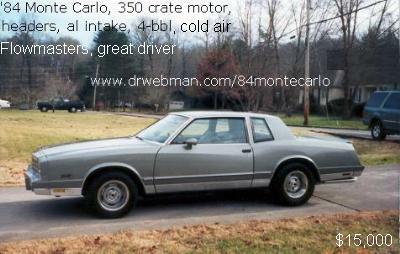 1984 Chevrolet Monte Carlo For Sale by Owner. OcoeeRealty.com is a Great, new website where you can buy, sell or trade properties. List your home here or browse our listings.